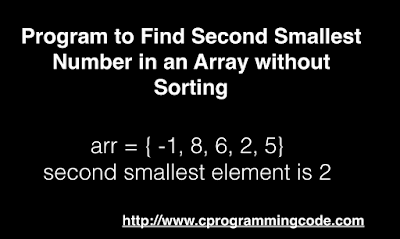 Write a C program to find second smallest number in an array without sorting. 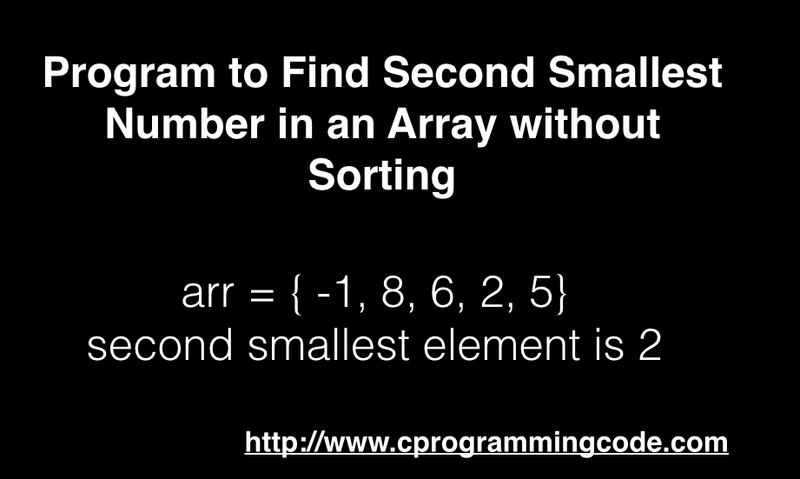 Given an unsorted array of integer, we have to write a code to find second smallest number without using sorting. We can solve this problem easily using sorting. First we sort an array and then we pick the element at 2nd index which is the second smallest element. This sorting technique won't work if the element of an array is repeated. Think for a moment how do we solve this problem without using sorting. 1. Take two variables smallest and secondSmallest and intialized with INT_MAX (maximum integer value). a) If value is smaller than smallest, then update smallest and secondSmallest. b) if the current element is smaller than secondSmallest then update secondsmallest. We have discussed the logic to find second smallest number in an array. Let's write a c code to implement them programatically.